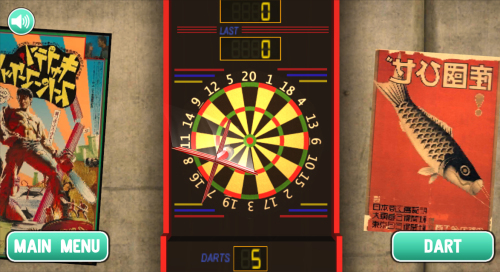 Description Arcade Darts 3D offers a beautiful 3D graphics, a fluid gameplay and at least a high replay value! You got five darts to play, if you reach a score of each over 120 points and over 340 points, you receive five additional darts to make a bigger score! You are also able to mute the sound during gameplay. While playing you are able to check the highscorelist of the ten best gamers. So have fun with this great game and lets see who will be the best! Controls Use the button navigation ingame.